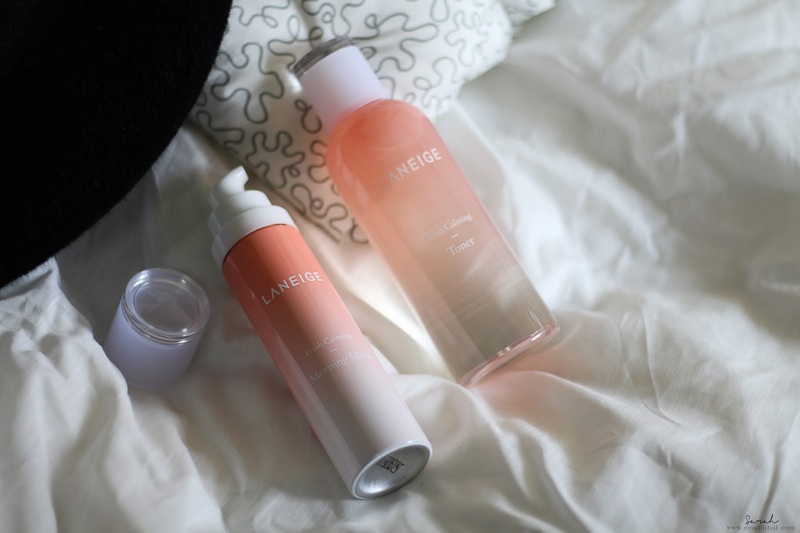 Laneige Fresh Calming Morning Mask & Toner - Face Mask in the morning ? Laneige New Fresh Calming range is designed for combination skin (dry cheeks and oily T-zone), to regain a healthy skin balance with. The main ingredients in this line of skincare is lychee and deep sea water to keep skin fundamentally smooth and moistured. There are 4 products in total - Gel Cleanser, Toner, Serum & last but not least Morning Mask. Laneige Fresh Calming Morning Mask is easy and quick leave-on morning mask that hydrates sensitive skin, soothes skin and helps makeup to be applied well. You'll LIKE how your skin feels in the morning after using this, supple and hydrated. You'll HATE it because it takes a while to sink into the skin, to be used as a morning mask. Laneige's new Fresh Calming Morning Mask is something entirely new to me. How often do you come across a skincare brand that promotes 'masking' in the morning. It sounds interesting, right ? The Fresh Calming Morning Mask comes in a mousse formula that smooths onto the skin like a slightly lighter lotion / moisturizer. Then all you need to do is leave it on your skin for it to sink in but I would usually massage it in because I personally find it rather messy to apply makeup on a wet surface. Once it's all absorbed, you'll have a smooth and supple feel. There's no irritating redness or tightness left behind. 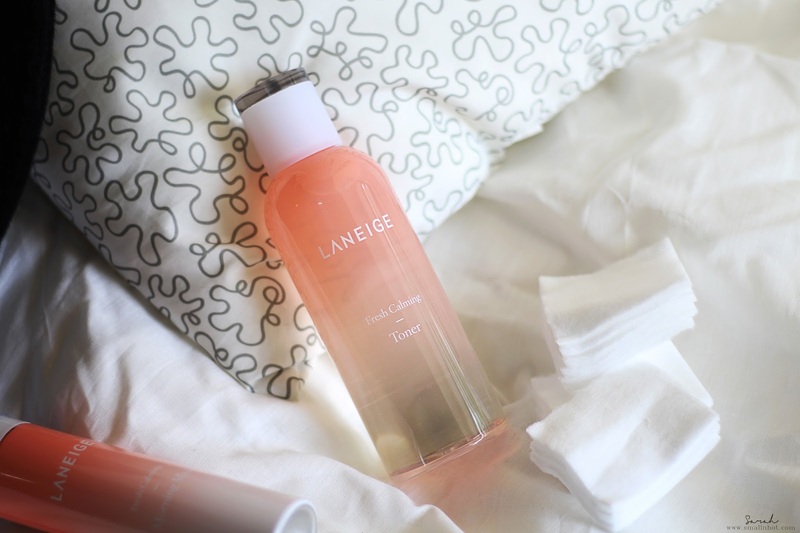 Laneige Fresh Calming Toner balances the oil and water content of skin and refreshes, hydrates and soothes skin. You'll LIKE it because it's a great toner, making your skin feel fresh and clean. You'll HATE it probably because it works pretty much like any other toner. Laneige Fresh Calming Toner is a gorgeous and soothing toner, feels literally like water. It's hydrating and refreshing on the skin. It also come with an affordable and decent price of RM 115 / SGD 27.2 for 250ml. Oily skin will appreciate the fresh feeling and a dry skin gal will enjoy how supple and hydrated the skin looks after tapping this on. But here's the thing, it works pretty much like any other toner. The Fresh Calming Toner is not doing much justice to the new Fresh Calming range. So if you are planning to give this Fresh Calming range a try, then you probably should get the Gel Cleanser, Serum or Morning Mask instead.